What makes a man a jewel in his community? Is it wealth, connections, or is it a firm commitment to his community? William H. Twiggs proved that it is what you do for your community that counts. His dedication to community had been immortalized for eternity with an Evanston park bearing his name. William H. Twiggs, one of four children of Martha Twiggs and John Williamson, left his home in Davenport, Iowa and came to Evanston in 1884 at the age of 17. He attended Garrett Biblical Seminary with roommate J. S. Woods who later became Ebenezer A.M.E. Church second pastor. Twiggs had many career paths, his first as a barber and soon after owned and operated his own barbershop at 573 Orrington (now 1573 Sherman Avenue). At around the same time, Twiggs learned the printing trade through Edward L. Kappelman and Robert F. Milne while supporting himself as a barber. The Afro-American Budget, conceived by his roommate, J.S. Woods and edited by Twiggs, was a periodical that had a national subscription. The first issue was dated May 3, 1889 and printed through University Press. Shortly after the publication, Twiggs opened his printing business. Twiggs traded the scissors for the press, brought a second hand Gordon Jobber Press and opened a print shop in the same location as his barbershop. In 1909, he moved his business to 1619 Sherman Avenue and then next door to 1621 Sherman Avenue, north of Fountain Square. Next to his print shop was a vacant lot dubbed “Twiggs Park” because of the branch and shrub debris scattered around the lot. This would foreshadow the official naming of another parcel of land nearly 75 years later. Twiggs printing business flourished during his career. 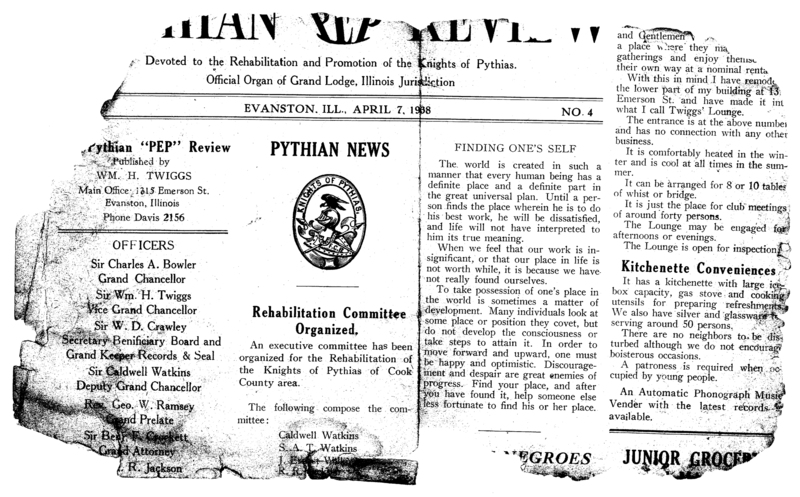 He went on to print the Reporter and Directory (c1909) and the Pythian “PEP” Review (c1938). The print shop’s final move was at 1315 Emerson Street in 1915 where he and his family lived. His office was known as the “Historical Den” where he displayed photographs and records of accomplishments of Evanston’s African-American community. A fire on Christmas day in 1955 destroyed everything except the printing press, which is now housed in the Evanston History Center. His career in printing was only one facet of his life. Mayor William A. Dyche appointed Twiggs City Sealer of Evanston, a position he held for 20 years. He was also appointed Permit Clerk during World War II by Mayor Harry P. Pearsons and appointed as a clerk at the city yards for several years. The public on concern of his “race” had scrutinized one of his appointments. Evanston White Clerks Too Important. Lucky to Be There Themselves These Hard Times. Evanston, Ill., Dec. 31.—Employees of the city hall, including a number of clerks, have been stirred by the rumor that Mayor Harry Pearson is about a [sic] appoint W.H. Twiggs, a race man, as head of the general information department. . . The one facet of his life he may have taken more seriously than his career was the memberships in which he committed himself. For over 70 years, Twiggs was a member of Ebenezer A.M.E. Church where he was a Sunday school superintendent for 25 years; boards trustee for over 50 years and was on the building committee for the construction of the church at 1109 Emerson Street in 1908. As a 56-year member of the Masons, Twiggs served on the construction committee for the Mount Moriah Lodge No. 28 Free and Accepted Masons. Designed by famed architect Walter T. Bailey, construction began in 1929 and dedicated in 1930 and located at 1229 Emerson Street. He also served on the Provisional Committee of the Emerson Street Branch YMCA on which helped to organize and raise funds to assist in the construction of the YMCA’s first building in 1914. Twiggs was also a member of the Pride of The North Chapter No. 61, and member of the R. B. Elliott Lodge No. 36, Knights of Pythias for 44 years. In 1986, on Simpson Street and the canal, a nine-acre park was officially dedicated in his name for his contributions to the Evanston community. In 1998, the park was refurbished and rededicated. Twiggs youngest daughter, Martha Twiggs Walker (then 72) spoke at the ceremony remembering her father, his contributions and how his spirit lives on through his family’s generations. William H. Twiggs died November 10, 1960 at the age of 95. His youngest daughter, Martha Walker died 2009 at the age of 94. His accomplishments and generosity left an impactful and beneficial legacy, which all of Evanston today can enjoy. He is one of dozens of gems that lived their lives in Evanston, contributing their time and resources to benefit all who live in this city. Side note: Daughter Kathryn, later as an adult, was the mother of the late Kay Davis, vocalist for Duke Ellington. Sources: First published in the printed version of Shorefront Journal, Volume One, Number Three, winter 2000. This article has been updated for clarity and with the availability of new information. Chicago Defender, January 15, 1916 “Mayor Appoints W.H. Twiggs to Position At Evanston, ILL”. January 1, 1916 “Evanston White Clerks Too Important”. From the Shorefront oral history archives: Martha T. Walker (daughter of William H. Twiggs) recorded April 1996; Katy Walker (granddaughter of William H. Twiggs) recorded October 2010. Shorefront archives “William H. Twiggs”. 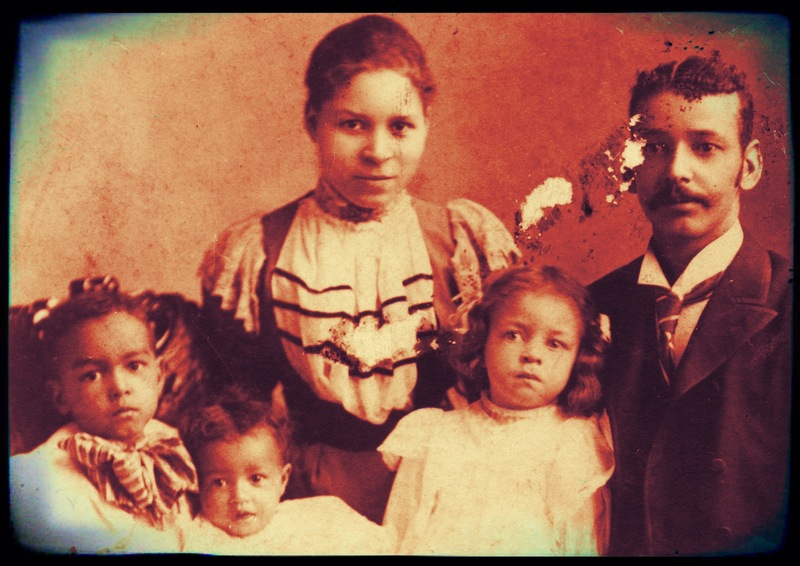 The Afro-American Budget, Northwestern University Special Collections. Photos courtesy of Katy Walker. Additional family information provided by Cheri Barner, a descendent of the William Twiggs’ brother in Davenport, Iowa. Katy, your family roots are examples of entrepreneurial talent that helped to make Evanston a haven for African Americans around the time your Grandfather made his mark here. I remember spending time in the home of Kenneth and Martha Twiggs Walker in their home off of Emerson Street where they operated their furniture reupholster business for many years. Your Mother Martha was so talented in sewing and creating a different look to the furniture she re worked for their customers. They were such as assuming couple that I had no idea how famous Martha’s Father had become. I hope the younger members in the Walker family will delve into the family history and stick out their chest at being apart of such history. I’m trying to find more information for the father of William H. Twiggs, John Williamson. All I have is an 1870 Census record. Do you have any information about Williamson after 1870? Please let me know as we are nominating the burial site of John Williamson to an program of the National Park Service called the Network to Freedom. Hi, what did the 1870 census say about John Williamson? I’m his Great-Great-Great grandson. I’m doing research about my family. Thank you.